I have something to confess...I was overly excited when my girls started to get into and watch Looney Tunes, as it was one of my favorite cartoon series growing up, and I have missed it. While my husband is not a fan of the violence that some of the cartoons convey, if you are looking for a fun, entertaining cartoon you can count of the cast of characters from Looney Tunes to deliver. 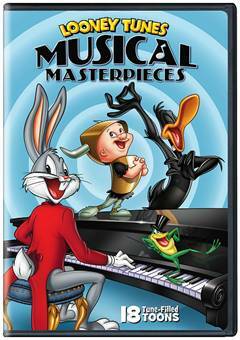 Recently, I was sent a copy of the new release out today on DVD to review, "Looney Tunes: Musical Masterpieces." If you were a fan of this classic cartoon series growing up, you will find yourself loving this new DVD, which includes some of the most iconic musical numbers from the Looney Tunes vault that you will find yourself recalling. It is funny...I can't remember what I had for lunch yesterday, but I can tell you all about a Looney Tunes cartoon I saw over 20 years ago just from hearing a certain musical number. Crazy! Both of my girls loved this DVD and found themselves not being able to sit still, as they wanted to get up and dance around, before finding their place near the television to watch the likes of Bugs Bunny and Daffy Duck ham it up on screen. Fans both young and old will love this new relase and want to make a point to pick up to add their growing Looney Tunes DVD collection. We have only had it for a couple of weeks now, but have already watched it a handful of times, with more views to come! "Warner Bros. Home Entertainment (WBHE) brings some of Looney Tunes’ most memorable musical cartoon favorites together for the first time in one collection, with the release of Looney TunesMusical Masterpieces, available May 26, 2015. This must-own compilation is comprised of 18 classic theatrical shorts that will get everyone’s toes tapping and hearts singing. Bugs Bunny and his pals will entertain both kids and adults alike with over “2” hours of hilarious musical numbers, featuring opera, piano concertos, jazz and much more. Looney Tunes Musical Masterpieces will retail for $19.97 SRP. Order due date has been set for April 21, 2015. This title will be released in time for the 2015 Tony Awards. “Music is such an important component of animation. Not only does it set the mood but it also tells the story,” said Mary Ellen Thomas, Vice President Family & Animation Marketing. She added, “The Looney Tunes cartoons we chose for this compilation represent some of the very best musically-driven shorts we have in our library. We’ve added some popular favorites and some rarer shorts that are not seen very often. Now Looney Tunes fans can have all theirmusical favorites together on one disc. If you love music and Looney Tunes, this is a collection you don’t want to miss.”"
These shorts were previously released on Looney Tunes Golden Collections. I would love to own this one I love watching this as a child.